What Are Double Blind Tests? A double blind test is a test where both the researcher and the test subject are unaware of who is taking the real treatment (e.g. a new medicine) or the placebo (the dummy treatment). Why They Aren’t Crucial When It Comes to Eleotin®. Multi-colinearity happens where there are two or more variables that explain or are responsible for an event and those variables statistically cancel each other out. These variables work the same way (are co-linear) and statistically cancel each other out. If you run a statistical inference test with these co-linear variables, you get an erroneous conclusion that none of those variables are important or contributing to the event, when the opposite is true. This means that statistically you must conduct placebo treatments until you discover the true contributing variables. But in the case of Eleotin® the major variables that affect blood glucose levels are not co-linear. For glucose control, the multi-colinearity is not prevalent among the major explanatory variables. So double blind tests do not provide additional information and are quite redundant. In other words, present research results are statistically powerful enough to make concrete inferences on the safety and effectiveness of Eleotin®. What a double blind clinical test does is not much more. However, clinical trials with double blind tests are being considered by distributors of some countries. Eleotin® is not a drug so we do not have FDA approval for it as a drug. To create a drug that would be approved by the FDA, a pharmaceutical company must first isolate one or two active ingredients. Since Eleotin® is made up of not just one, but many herbs, isolating one active ingredient may be almost impossible. There are an infinite number of combinations of chemical variations that happen during the brewing and digestion process. There is a strong possibility that it may never be possible to isolate the single active ingredient in Eleotin®. Also, even if it were possible to single out the active ingredient, there is a high possibility that these active ingredients would be considered too toxic. Scientists feel almost certain that those few ingredients when isolated and singled out would be toxic when used in large quantities. Singling out active ingredients runs directly counter to the basic approach of Eleotin®, which emphasizes “gentleness and mildness.” Remember Bülgis principle that we discussed earlier. This is the complete and balanced approach. In fact, this point is well known by the people of the FDA. They suggested that the packages of Eleotin® be marked clearly as “dietary supplement.” . Applying for drug status takes at least $800 million and about 8 years to complete on average. And this still does not guarantee that there will be success. Also, this additional cost would be added to the cost of purchasing Eleotin® for the customer. It would force the price of Eleotin® to rise. • You can buy dietary supplements without a doctor’s prescription, while you need a doctor’s prescription to buy pharmaceutical drugs. • Medical insurance covers drug cost, while dietary supplements are not normally covered. Eleotin®s ingredients or herbs have been reviewed and approved in Korea, Japan, China, Taiwan and a few other countries. All the ingredients are recorded in many countries pharmacopeias and food codes. How Come My Doctor Has Not Heard of Eleotin®? It usually takes a long time for doctors to know about a new product. Considering that Eleotin® was introduced in March of 1998, and that Eastwood Bio-Medical Canada Inc. (EBMR) was a tiny company, Eleotin® is very well known for such a short period of time. Also, a survey has shown that almost 100% of Korean endocrinologists know about Eleotin® or have at least heard of it. About 70% of Korean diabetics know about or have at least heard of it. Diabetes associations of a couple of countries officially issued special review newsletters. Of course, when compared to a drug like, say, Viagra, it is a relatively unknown product. It is known that Viagra marketers spent billions of dollars to promote Viagra. Eleotin® obtained its reputation with virtually no marketing or PR budgets. No money was spent to “push” or “promote” Eleotin® to doctors. One statistic states that the average medical doctor in the U.S. receives, in one form or another, the support of pharmaceutical companies of up to $15,000 a year. Doctors are human too. Their opinions can be influenced by their supporters and sponsors. Eastwood Bio-medical Research Inc. never did and never will give any financial support to medical doctors. Therefore, you can trust that when your doctor recommends Eleotin® that it is purely due to their conviction in the benefits of Eleotin® for you, and not for their personal financial reasons. Of course, a doctor can be a distributor of Eleotin®, but in that case, it is required that he should clearly tell the patient that he is a distributor. Eleotin® has also received its fair share of the media. It has been reported on many TV shows and newspapers. With virtually no advertisement, except for a simple news release, almost 5,000 units were sold during the first eight months of introduction. 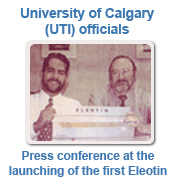 It will take time for everybody to know about Eleotin®, but in time they will. The average life span of an herbal diabetes product is 6 months. They usually make huge unsubstantiated claims and disappear. Some medical doctors were under the impression that Eleotin® was another one of those products. But after many years of ever growing sales and ever accumulating evidence, the attitudes of doctors has changed substantially. Most western doctors used to be quite skeptical about herbal products. This skeptical attitude of is rapidly changing. In Europe and Asia, many doctors with conventional western medical training are using these kinds of herbal remedies. There, herbal medicine is not “complimentary.” It is already a part of the mainstream. In North America, more and more doctors are also exploring herbal products with an open mind. Eleotin® being developed and tested at a traditional western university in North America is positive proof that western educated scientists and doctors are willing to openly explore all possible treatments as long as they are safe and effective. If doctors review our product and the scientific research conducted with an open mind, then the worst reaction they may have is, “I will wait until more evidence is available.” That can be accepted. Now, there are over 200,000 users, and study after study by highly respected experts prove and confirm the effectiveness of Eleotin®. There is more than enough to convince.